Melbourne Band 358 – Are you organising a wedding, corporate event, party or other function and want a band that will make it a raging success. Then Melbourne Band 358 is for you. We have what it takes to help make your event the best it can be. Check out this quote from one of our many happy clients: “We had a fantastic time and the band is fabulous. Everybody was up and dancing and was commenting how great the band was and where I got you guys from. The owner of the venue thought you were fantastic as well. I would recommend your band to anyone who is looking for a great time dancing as you had everybody on the dance floor. 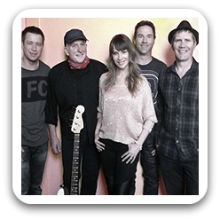 Melbourne Band 358 is fun and professional five piece covers band which has a lead female singer, guitarist/vocals, drums, bass and keys/vocals. Our lead singer can sing anything from hard rock to wedding ballads. The band plays a high energy mix of hits and dance numbers from the 60s to now. It is available for all types of functions, events and weddings. Also with weddings – we can even assist with the MC duties if you want! EXTRA EXTRA: If you or your friends have always wanted to sing in front of a live band then Public Nuisance is for you. If you pre-arrange it when you book, we can do a set where people from your function can sing with the band from our songlist. We call it BANDAOKE – its a blast and you can be the star! Our focus is on ensuring that your function is a success. We pride ourselves on being professional, reliable and flexible so you have a good time.. This band was fantastic. I booked them for my husband’s 60th birthday. I was especially interested in their comment of bandoake as we have friends who like to sing. The band were very obliging with our singers and a lot of fun was had by all. The bands music during the evening was terrific and the dance floor was always packed. I would and have recommended them.